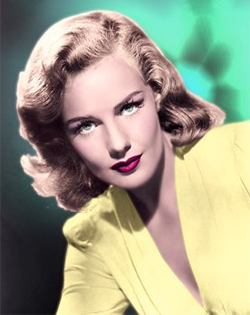 For those without comedic tastes, the self-proclaimed experts at Wikipedia have an article about Frances Farmer Will Have Her Revenge on Seattle. 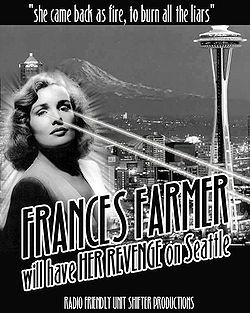 Frances Farmer Will Have Her Revenge on Seattle is a science fiction/horror film written, produced and directed by Edward D. Wood, Jr. in 1958, and released in 1959 as a Double Feature with his classic Plan 9 from Outer Space. The plot of the movie revolves around the descent into madness of the main protagonist and features what were for the late 1950's "state of the art" footage of the destruction of the Pacific Northwestern city, compariable with many of the Gojira films of the same era. The film remained largely forgotten until it gathered a cult following during the early 1990s after its showing on the late night horror movie channel Shadowland. Since then the film has enjoyed a mark success, and was released to DVD in 2001. Seattle's cruel and evil scientific community perform a number of experiments on the embryonic Frances Farmer "in utero", leading to a change in her metabolic rate. The young Frances grows up to be an intelligent, articulate woman, though prone to bouts of anger. As a teenager she wins a trip to 10th Century Northern Europe where she marries Nordic explorer Leif Erickson. On returning to the American Northwest and the 20th Century, Frances witnesses the landing of a "Space Ship" and the alien visitor within. On opening a heart shaped box within the alien vessel, Frances is infected with "atomic radiation". Rushing back to Seattle with the tale, she is ridiculed by the local law enforcement, who call her husband. Leif sees what he regards as his wife's relapse into alcoholism as an opportunity to have Frances committed to an asylum, in the hope of continuing his earlier career. Whilst captive within the asylum, Frances is subjected to a number of treatments from members of the scientific community, including regular and increasing injections of Lithium. Over time the treatments trigger changes caused by the atomic radiation, until one night she is visited by the alien within her cell. He tells her his name is Klaatu and that she has achieved a state of Nirvana. With her new powers she is to destroy those who would threaten the very peace of the universe. In the great climax to the film Frances returns to the city of her birth in order to begin a raging rampage of death and destruction, culminating in reducing Seattle to a "lake of fire". 2004 saw the release of the digitally re-mastered and fully colourised version of the film. A number of similar films emerged in the years immediately after its release including "Hedy Lamarr Destroys Tokyo" and "Anaïs Nin Takes Manhattan". Both films faired badly at the box office leading Hollywood to abandon the genre for a number of years, until the release of "Goldie Hawn did WTC" in 2001. The late critical success of the movie has lead to a number of imitators, one of the most famous in recent years been Ju-on: The Grunge released in Japan in 2003 which in turn has spawned several sequels and an American remake titled The Grunge, was released in 2004, which in turn would spawn a series of sequels and a prequel, and so on and so forth. The film was shot with a budget of under $140,000 (Canadian), mainly through utilising sets left over from previous, higher-budgeted RKO productions. Eagle-eyed viewers may have noticed that the same lobotomy equipment is used in the film as featured in "Gone with the Wind", whilst the sanitarium used for the sequence is located in Beverly Hills, and can cite a large number of Hollywood celebrities amongst its clientelle, including Judy Garland and Liza Minnelli. The original novel differs slightly in content and tone from the film. In the novel the story is told through flashback. 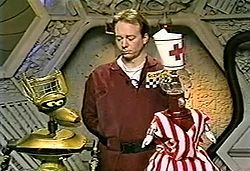 The movie was featured in an episode of Mystery Science Theater 3000 where Tom Servo, Crow T Robot, and Joel Robinson were making fun of the film in a mildly sarcastic tone aboard the HMSSatellit der Liebe. Fans of the show were so shocked by the comments that the show was immediately scrapped and replaced with something considerably less funny.